I come from a long line of killers... cereal killers. It's bad, guys - box after box of cereal disappears in the blink of an eye - and if it's granola? It's gone in seconds. Good granola is expensive, however, so this cereal killing habit can get quite expensive. That's why granola was always a treat in the SIL house - until Kristy perfected the ultimate healthy granola recipe. Unlike store bought granola, this granola is refined sugar free, gluten free*, low fat and contains just five ingredients instead of thirty three unpronounceable ones. 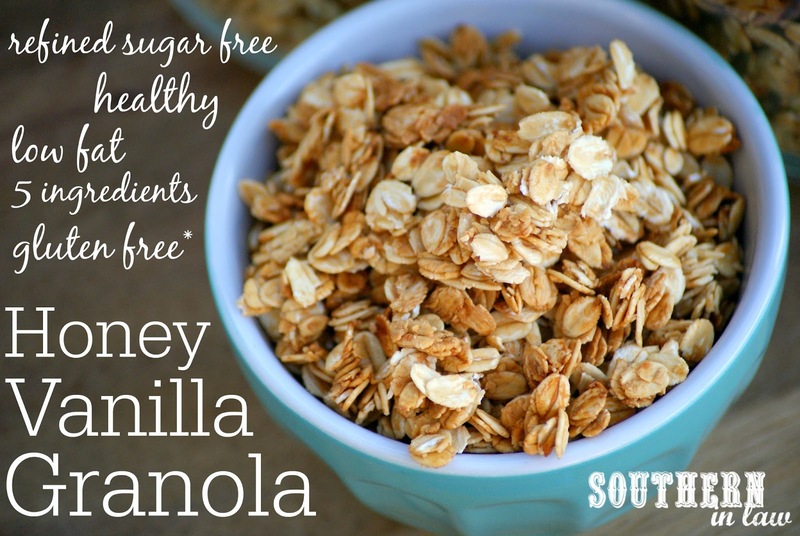 It's also super cheap to make - we worked out that a big batch of this granola costs us around $3! You wouldn't even get a bowl of homemade granola in a cafe for that much! And you certainly wouldn't get the same amount of store-bought granola for $3. I make a big batch of this every two or so weeks and the whole family loves it - it's crunchy, just perfectly sweet and delicious on its own or as a yogurt topping. Jesse likes his on top of yogurt with fresh banana whilst I like mine with cottage cheese, peanut butter, chia seeds and fresh strawberries or banana - but my Dad? He likes his straight up. We like to keep things simple with this granola, however, you can add in whatever dried fruits, nuts or spices you like! 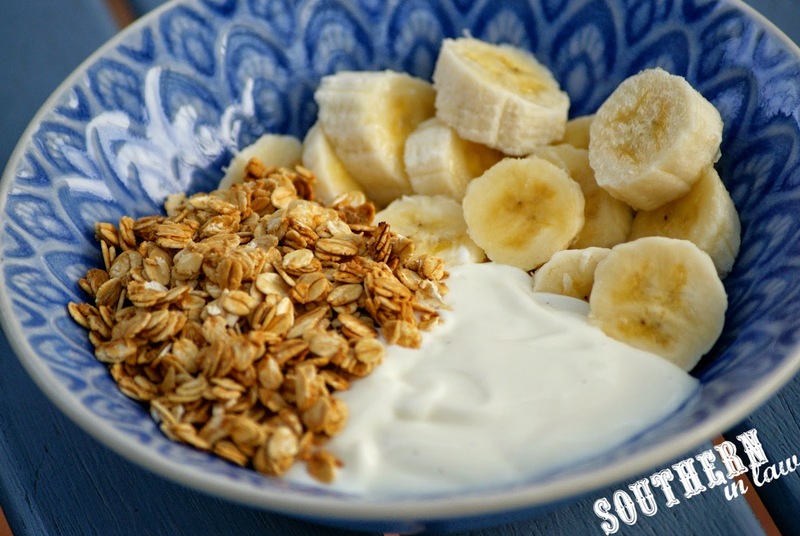 Put down the shop bought granola and try making your own Healthy Homemade Granola! 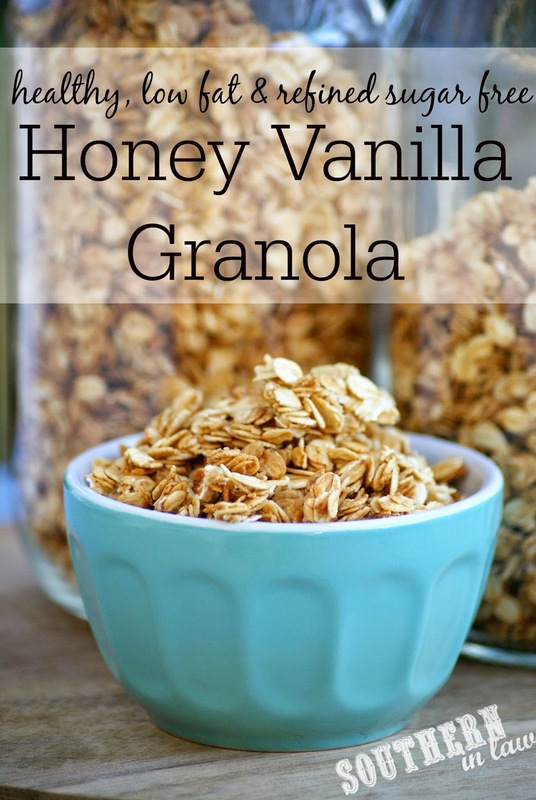 This Low Fat Honey Vanilla Granola Recipe is also gluten free and uses just five ingredients. It is super simple to make and yields a large amount for just $3! Grease and/or line 3 baking/cookie sheets with baking paper. Preheat your oven to 150C/300F. Heat your honey, oil, salt and vanilla in a medium saucepan until combined and runny. Mix your honey mixture through your oats and add in your lightly beaten egg white. Stir until all of your oats are coated and pour onto your prepared baking sheets - spreading out slightly but still leaving clumps for crunchy granola clusters. Place your granola trays into the oven and bake for ~20-45 minutes (depending on your oven and how much granola you have) or until your granola is golden and crunchy and not too sticky to touch. Rotate the pans during baking to ensure they are evenly cooked. 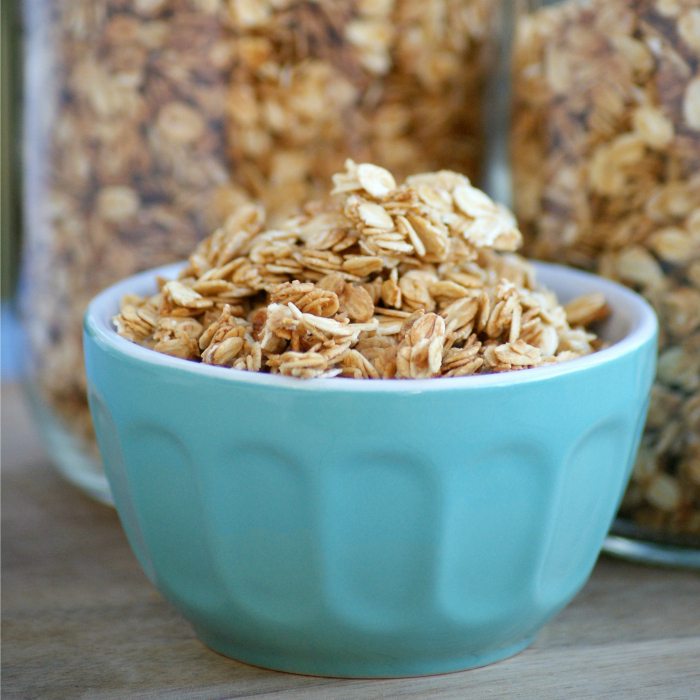 Allow to cool completely before storing in an airtight jar or granola. We've never had a batch of granola last more than a month (and that was after hiding it to test freshness), however, it will keep fresh for quite some time stored at room temperature in a sealed container! *Find out more about Oats on a Gluten Free Diet at http://www.southerninlaw.com/2013/06/are-oats-gluten-free-where-to-buy-gluten-free-oats-in-australia.html . If you cannot tolerate oats you may use quinoa flakes instead, however, this will change the taste dramatically. **The egg white isn't a must, however, we do recommend it for super crunchy granola with delicious clusters! But tell me, what's your favourite cereal? And what's the favourite breakfast in your household? At the moment it's either this granola or our breakfast banana bread and on the weekends when we have a bit more time, these healthy buttermilk pancakes have been requested week after week! It is - but it's SO delicious! Our friends and family always ask me for the recipe and when I give it to them they're like "wait, are you sure this is your granola recipe?!?!" Could i sub agave for the honey? Thank you! Looks delicious so I am making it this weekend! My pleasure, Alex! I'm not sure about whether agave will caramelise quicker so just keep an eye on it! Be sure to take a pic of your finished granola so we can add it to our reader showcase on www.facebook.com/southerninlaw ! So yummy so glad I found this recipe. I just made some and figured out the nutritional value based on the brands I used and this saves me 100 calories per 1/2 cup serving!! Thank you thank you from a mama who needs to get back to my pre baby size!! Have you ever tried with coconut oil instead of vegetable oil? We most certainly have and it works perfectly! Do you know how many calories are in a serving? Hi Lee Anne, I'm not sure of the calorie count per serving, however, other commenters have said this recipe saves them over 100 calories per cup compared to the brands they usually buy. You can work out the nutritional information using an app or website like MyFitnessPal if you like! Thank you so much for getting back with me! I made this with my seven year old daughter earlier in the week. We, too, can take down boxes of store bought granola which are crazy expensive and full of extra stuff. I did tweak the recipe by adding a quarter cup flax seeds and less than that of sunflower seeds and a couple of tablespoons of unsweetened coconut. Upon first tasting I definitely noticed the missing layer of store bought sweetness but what that does is bring out the crunchy oat flavor. As the week has progressed I like the granola more and more! I think this is my new favorite granola! Thank you! This is an awesome, FANTASTIC recipe! Thanks so much! I added some sesame seeds too. I am so glad you loved the recipe! To make it less chewy, bake it for the suggested time and then either turn the heat down and continue baking until it's crisp or turn the oven off and leave the tray in there for an hour or so (without opening the door) to dry it out. This recipe looks delicious! Found this on Pinterest on my wild search for new recipes I can eat. My doctor doesn't want me having oil for 3 weeks because of a gallbladder problem I currently have. Do you have any suggestions on how to make this without the oil?